Рада вас приветствовать на празднике в честь 4й годовщины Altenew! А поскольку все мы люди креативные, то и отмечаем соответственно - с мастер-классами и тонной вдохновения с любимыми материалам. Ну, а поскольку мы еще все любим подарочки, то и призы тоже будут!) И не только от Altenew! Для своей первой открытки я использовала ножи от Altenew ( так как не одними штампами едины:)) : Peony Dream 3D Die Set и рамку с открыточного набора New Day Card Kit. Для надписи использовала набор штампов Craty Friends. Для основы использовала красивейший текстурный кардсток. А верхний слой цветка покрыла блестяшками Nuvo Drops. I have few projects and video to share with you today. 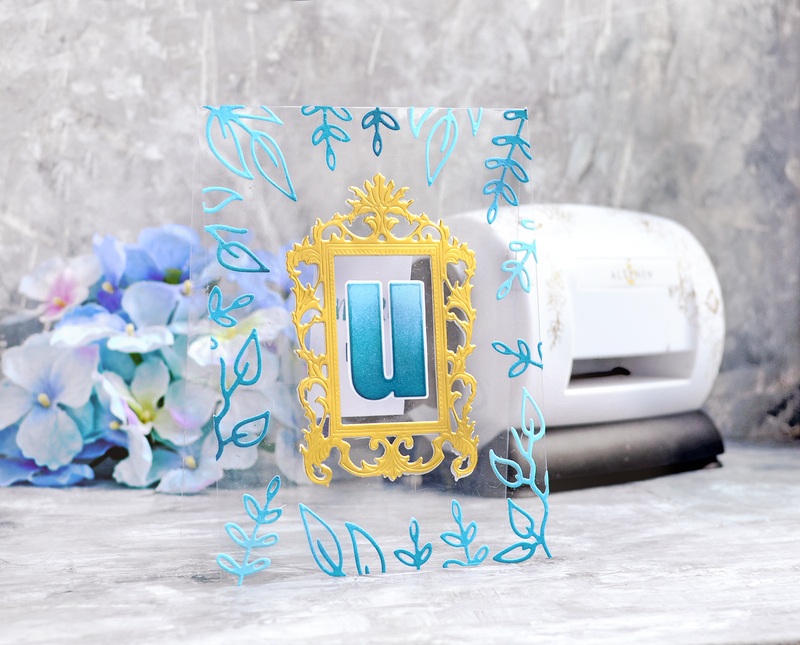 For my first card I used Peony Dream 3D Die Set and frame from the New Day Card Kit. For the sentiment I used Craty Friends, I heat embossed the sentiment on the black cardstock. For my cardbase I used beautiful textured cardstock from Altenew. And I covered a peony flower with shimmer Nuvo Drops on a top. Вторую открытку я хотела сделать полностью однослойной, для этого использовала технику маскинга и собрала в одно целое штампы из разных наборов: веточку из Beautiful Day, рамочку из Framed Stamp Set, надписи и сердечко из Sewn with Love Stamp Set. My seconf card I kept clean and simple. On this card I combined different stamps: flowers from Beautiful Day, frame from Framed Stamp Set, heart and sentiment from Sewn with Love Stamp Set. И третья прозрачная открытка :) По ней можно посмотреть видео мастер - класс на моем youtube канале. Было немного тяжеловато ее сфотографировать, по этому покажу на разных фонах. And here is a third transparent cars. It was little bit dificult to make a photo :) How I made this card you can see on my Youtube channel. To create this card I used some dies from Altenew: Bold Alphabet Die Set, New Day Card Kit, Create-A-Wreath Die Set. There is a hidden massage inside of the card. Love that gold frame with the pretty flower peeking through! So beautiful ... I love the acetate card! Super beautiful creations! That transparent card is sooo pretty, I love it! Your cards are super Awesome !! Last one is just Stunner ! Thanks for the video. Awesome creations! I especially love the transparent card! Your cards are so creative! Obviously your kitty things so too!! Your cards are gorgeous, that fully clear one is absolutely stunning, it made me gasp and stare at it for a few minutes, LOL! Thanks so much for sharing and inspiring! Gorgeous cards! The transparent card is my favorite. Beautiful cards. The acetate is my favorite. Thanks for sharing and inspiring us. Love your cards! The acetate is so lovely, great idea! Thank you for sharing! Beautiful cards, love the gold frame and the acetate card is stunning! Love that transparent card! Great ideas. I love seeing Altenew's products in use. Always to many wonderful ideas. Happy Anniversary Altenew! Very pretty cards. Love that acetate one. Love the acetate card!!! Beautiful work! So beautiful and love the acetate card! Very pretty cards, very creative! Each card is beautifully framed! Gorgeous! How fun is that and I love your cat . I especially loved the card on the transparent "paper". Thanks for the beautiful ideas! I just love the peony layered die and how you used it. great cards!! The transparent card is very cool!! I think the kitty likes it also!! Lol Thank you for sharing! Love how simple yet gorgeous your cards look! My favorite has to be the acetate one! Everything about it is soo pretty! Beautiful cards!! Such pretty flowers. Love the frames. Thanks for the inspiration! It looks like the cat prefers the transparent card. I do too! Very lovely transparent card. Thanks for tip about the glue. My furry friend likes to eat plastic too ! All of my stamp sets are put away promptly after use. Thanks for sharing. All of your cards are just wonderful!!! 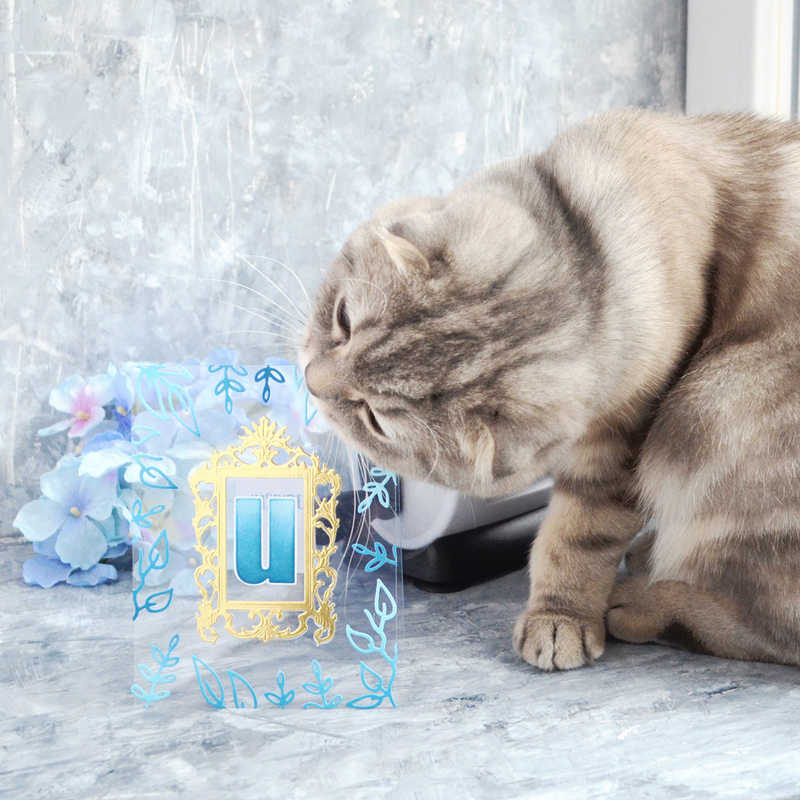 Awww, your kitty loves your transparent card, too! It's really pretty and fun. You do lovely work. This card is fantastic! I love the blue foliage details on the side. Thanks for the tips! I love how you used frames to make that the focus of the card. Sorry but that cat stole the show. TFS! Love your clear card. Like the photo of your cat caught in the act. My cat has also left teeth marks and paw prints on my projects. Thanks for sharing. These are all so stunning!! I love the designs of each one, especially the clear card!! So creative!! Thanks for the amazing inspiration!! Beautiful cards and I love the transparent one! Thanks for sharing your techniques and loved your video! Great cards, Galina! I love the transparent card. Very striking and so fun. Thanks for the fun blog hop. Amazing cards, I absolutely love the transparent card. Beautiful cards! I’m loving the transparent card! that transparent card is so darling, but the cat!!! LOL! Cuteness! Transparent cards are always so fun and unexpected! These are all lovely. Like your kitty, I love the acetate card the best! Love the secret message and Oliver. Beautiful cards, thanks for sharing with us. Wonderful cards! I really like the transparent one since blue is one of my favorite colors. I love the ombre ink technique. Your cat is really cute too. Thank you for sharing this unique and wonderful transparent card ! The colors you chose are elegant and the result is stunning ! TFS. So beautiful. Just lovely cards and your cat is adorable. Thanks for the inspiration! I like these pretty framed projects. The clear card is especially fun and different. 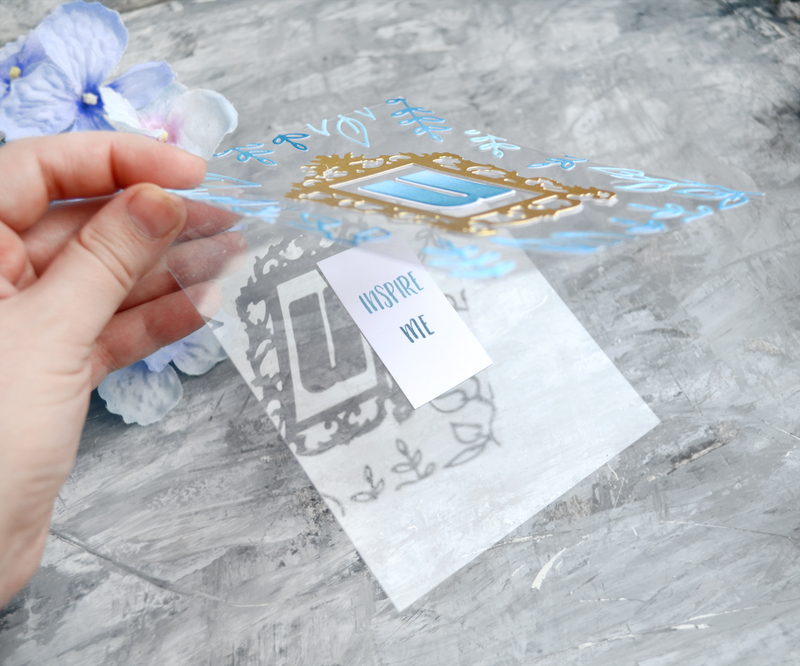 Beautiful transparent card! Thank you for sharing! Love Love the transparent card! Very beautiful! And your kitty is gorgeous, and loves to help with your projects. How fun!! you just can't go wrong with a frame as the focal element, or as a background element, ...or as an accent element. And your kitty apparently agrees! Thanks for all of these inspirations, but especially for the tips re: the clear card. It really packs a punch! And is harder to pull off than it looks. PHENOMENAL GORGEOUS transparent card - that one blows my mind away! Aw! You cat is gorgeous! And I love your transparent card. Beautiful cards and fantastic designs with frames. The acetate card is awesome! I loved the clear card. What a fabulous idea. very beautiful! Beautiful projects...that clear card is super cool! I love this. Such a pretty creation! Stunning cards. I am especially fond of the acetate card. It looks so beautiful and seems to me like it wouldn't take a lot of time to make. Rub your cat's ears for me. I love cats. Galina, that transparent card is so amazing...I love the hidden message inside! It looks like your kitty loves it to! And I really love your first card with that peony peeking out of the frame. Thanks for sharing with us!! all gorgeous cards - and love the pic of your cat! Love your use of the frames!! And the transparent card. Super ideas!! Your transparent card is so unique!! Love it! The transparent card looks freaking awesome! I love it! Love the transparent card! So pretty. All of your cards are so pretty! My favorite is definitely the on done with Acetate. I think your gorgeous kitty agrees with me, too! Thank you so very much for the video. VERY beautiful and unique cards!! Gorgeous cards! 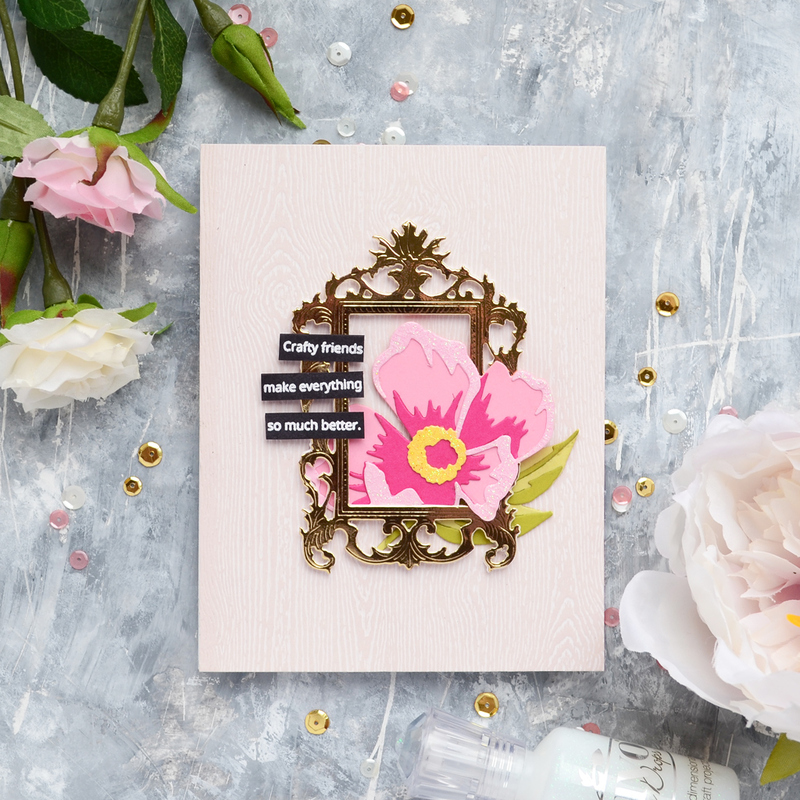 The Peony Dream 3D die set is a favorite of mine, so I love your card featuring that lovely bloom! And your kitty is beautiful too! All 3 cards are so different, yet so lovely! Thanks for sharing! Your cards are beautiful, you are so creative! I see your cat likes to help you, mine does too! Beautiful cards! My favorite is the transparent one! I love making these because they are so unique! Your furry helper is a darling! I love when designers share their fur babies with us! They are so helpful when creating! TFS! Excellent creations...especially your transparent card...that was my favorite one!! Beautiful cards. The transparent card is gorgeous and so is your cat. So creative, thank you for sharing your talents. The acetate card is gorgeous! The clear card is my favorite! And your cat is adorable! Your cards are super amazing....i swear the most wonderful projects I have seen...loved all completely!! All your cards are beautiful. Thanks for sharing your process video. Happy Anniversary Altenew! Love your style and how you use different stamp sets together. Thanks for the tutorial. Awesome card!!! I love everything about it! Thanks for the video, too. Just like your card says, you inspire ME! I'm going to have to get those Altenew products. Love, love, LOVE! Love your cards esp the transparency card! Gorgeous!!! Wow! Each card similar yet so different! And all cards beautiful. Thanks for your inspiration! I think the second card with the cross stitch heart is my favorite. Beautiful cards. Love the transparent one. Really liked your acetate card. Your cat obviously agrees. Gorgeous cards! Wow, I love them! Great cards. I especially like the see through one. Love that frame in gold!! Beautiful cards!! I really love the transparent one :) Thanks for sharing! 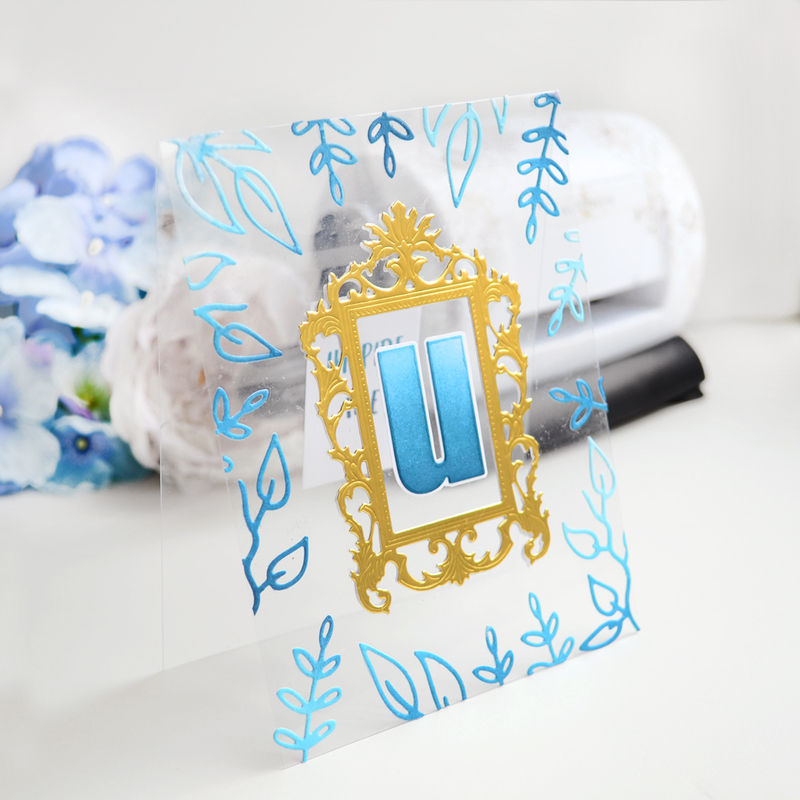 Such pretty cards, love the frames and how you used them, especially in that first card! Thanks for showing us 3 beautiful cards. Wonderful projects! The Peony is one of my new favorite dies. Beautiful cards with gorgeous products. Congratulations to my favourite stamp company! I'm so glad I discovered Altenew early on with one of my all-time favourite stamp sets - Vintage Roses. Since then I have been stunned again and again by their beautiful products - especially their layering flowers. Here's to many more happy years! Three beautiful and elegant cards and your kitty is very cute! Beautiful cards! I especially love the two made with the New Day frame, which I have never used and appreciated seeing how to use the die. The video for the acetate card was so helpful in seeing how you assembled the card! Thanks! Your cards are lovely! I love how you combined several of Altenew’s stamp sets on the second card, it looks great! Pretty cards! I love all the cross stitch stamp sets, so it was nice to see that you used one. Your kitty is so adorable! Beautiful cards. Your cat is adorable too! Very pretty cards. Enjoyed your video and especially your kitty! Thanks for sharing all these inspiring ideas and techniques! What a unique and beautiful card, I also Love your kitty cat! Your clear card is so pretty. Love it. Wow what beautiful cards, thanks for sharing! Beautiful! I love the last one the best. This clear card is just gorgeous and so well done! Thank you for the inspiration. Such beautiful cards - I love the "Frame" theme! The last card is just amazing - I love unexpected details in handmade cards. Thanks for the inspiration today on this blog hop. Happy Anniversary, Altenew! Gorgeous cards. Love the die cuts on your first card. Beautiful cards. I love the blue and gold transparent card. Thank you for the great tip about the stick it sheets. Adorable cards. Just love them all! Your creativity is amazing. All the cards are stunning, but the transparent one is my favorite by far. These card designs are amazing and I really love the acetate card. Your cards are all so pretty but my favorite one has to be the transparent one! 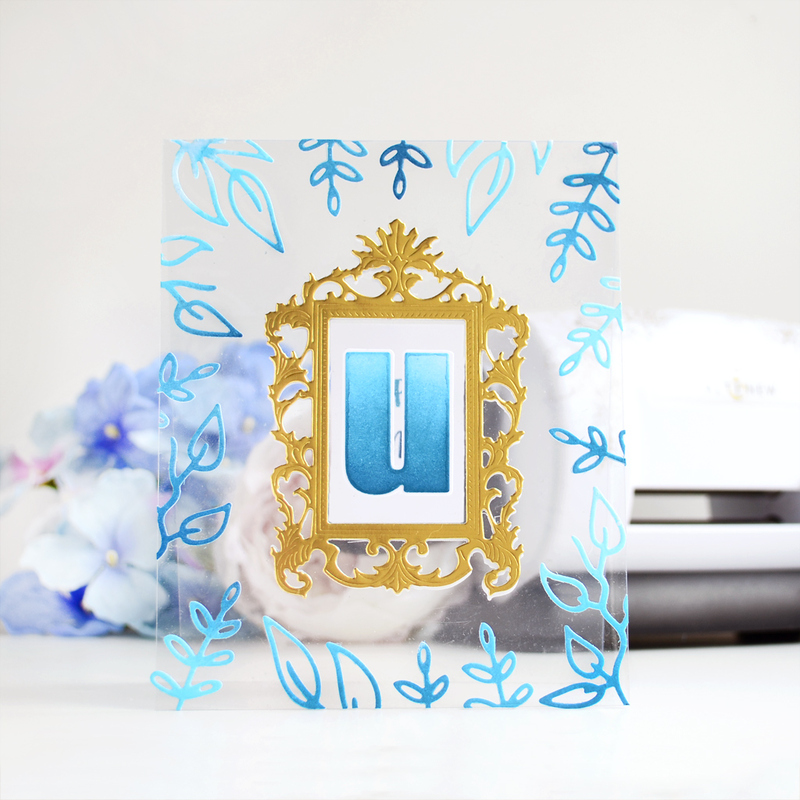 Love the blue die cut that make up the frame for the center image! Oh my the acetate card is amazing so inspiring! Fabulous projects and ideas. Love how you used the frames. Great video too! Love the use of frames on all of your cards. Thanks for the inspiration. and the blue ombre leaves! I love the transparent card. Thanks for sharing it with us. Gorgeous inspiration Galina, thanks for sharing! Fabulous cards, just love each one. Beautiful cards; the transparent card is especially gorgeous! The see through card is my favourite! So gorgeous! Love the transparent blue card. Am your newest follower and loved your Altenew work today! So fresh and fun!! Love the clear card especially! Fun video! Your "framed" cards are all beautiful ... but the blue transparent one is amazing! Just love it! WOW the transparent card is AMAZING!! Wonderful projects! Love the transparent card! Beautiful. Especially love your helper! Thanks for sharing. Cute cards and cute kitty. Glad to see my cat is not the only one that likes to eat projects. I have only recently seen these clear cards and they are stunning! I am loving all the frames you did. Your transparent card is truly incredible ! It’s so classy and delicate !! And thanks for the video with your lovely cat ! Wow, some beautiful cards! Love the transparent one, truly inspirational! Thanks! Your projects are so pretty! I love the clean, simple look and frames. Thanks for the inspiration. Your transparent card is amazing! TFS!! Love all of your cards! I like the flower peeking out of the frame and the clear card is beautiful! I think your cat approves too! Love the acetate card! Beautiful! Both these cards are so pretty..
hope to be a winner with the Altenew Anniversary Blog Hop also! fabulous projects, and your kitty is darling. Such beautiful cards, love all of them. Your cat is soooo ADORABLE!! I love the layered card but the transparent card is just so cool. Your cards are awesome Galina, thank you for sharing this with us and for the How to do video! Beautiful cards--I love the techniques! Thanks for sharing! These cards are all lovely, but my favorite photo is definitely the behind-the-scenes one with your cat, because mine do exactly the same thing! They just love being in the middle of things! Also, well done with photographing the acetate card; I can only imagine what a pain that would be to try and get a photo. Thanks for sharing such beautiful ideas with us and helping celebrate Altenew's birthday! Very beautiful cards. Especially love the acetate card. Absolutely beautiful cards! Love your use of those gorgeous frames! Love these - especially the clear acetate card. So lovely! Great cards, and I love how you tucked that peony into the frame! Beautiful! Love your creative use of frames on these cards. Thanks for sharing the technique video. Wow!! Absolutely Gorgeous cards! I loved the transparent card so much. Thanks for the inspiration.